The past two weeks in the Introduction to Social Research Methods MOOC (SOCRMx) have covered ‘How to Lie with Statistics’ (Week 6 Quantitative data analysis) and ‘Interpretation and Trustworthiness in Qualitative Data Analysis’ (Week 7). Lots of resources have been provided for the Week 6 topic on quantitative data analysis. I have saved them for future reference, should I ever go down that track. It was interesting to see that more course participants got involved in discussion in the Week 6 forums. I’m not sure if that’s because a positivist approach comes more easily to those new to research, or whether it was because once again the resources were extremely good and the tutor for this week – Rory Ewins – actually engaged in the forums and provided feedback! The resources for Week 7 on qualitative data analysis are very familiar given that all my research has taken this approach, but once more the resources provided on what we mean by trustworthiness and how to code qualitative data are helpful and thought provoking. Again I have saved these resources for future reference when I can explore them with more time. I think both these topics require and deserve more time than one week to get to grips with. The topic of qualitative analysis reminded me of an excellent video that was shown in the first week of the course under the title of theoretical considerations in research design. This is a SAGE research methods video and therefore not open access, but if anyone from SAGE visits this post, I would urge them to make this video publicly available. I think both novice and experienced researchers would find it hugely helpful. Scott, J, Williams, M & Letherby, G. (2014). 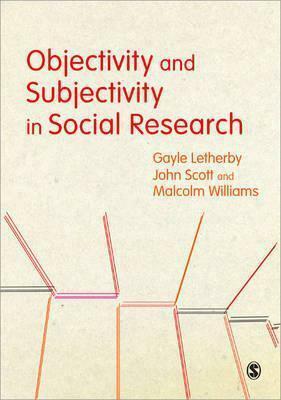 Objectivity and subjectivity in social research, SAGE Publications Ltd., London. These are the notes I made from watching the video. John Scott starts by drawing on the work of Kant and Mannheim to discuss how subjectivity, objectivity, relativity and truth have multi-faceted meanings. We see the world differently according to our social location (our perspective) and we construct knowledge relative to that location. But if this is so, how, as researchers, can we present a truthful representation of the world. One way we can do this (which Iain McGilchrist has also discussed in his work on the Divided Brain) is to try and synthesise different standpoints (alternative perspectives) to achieve a better model for understanding the world. The three authors each approach research from different perspectives. Malcolm Williams adopts a socially situated objectivity approach, Gayle Letherby a theorised subjectivity approach and John Scott, is somewhere in the middle of these two perspectives, and the point was made that it’s not necessarily a question of either/or, as shown by mixed methods approaches. Malcolm Williams sees objectivity as a value which is socially constructed. The pursuit of truth is a key research value and he argues that a necessary condition of objectivity is to begin with subjectivity. Gayle Letherby recognises the personhood of research and the complex relationship between researcher and respondent. From this perspective research is subjective, power laden, emotional and embodied. A theorised subjectivity approach is concerned with how identity plays out in the research process. Gayle Letherby tells us that interrogation of the self in research, with reference to the ‘other’, gets us closer to a position that we might call objective and that autobiography is always relevant. We need to interrogate our biases, but we should avoid demonization of subjectivity. Subjectivity is not a redefinition of objectivity, but starts from a different place. Objectivity and subjectivity are interrelated. Whether we take a subjective or objective approach, social science research does have validity and needs to be defended. This does not mean that one account is as good as any other. Researchers must be responsible and explain how we got what we got and how what we did affects what we got. Research always involves a view from somewhere and we need to write about our subjective positions. Where did the research question come from? Why was a particular approach adopted? Can we justify why our findings are important? What is our ethical position? Have we acknowledged that ideas about knowledge can’t be separated from ideas about power? (Foucault’s work is relevant here) The social and political role of research means that there is no escape from issues of power. Leaving power outside the door as much as possible.